When reading about the habitat of non-breeding male Vermilion Flycatcher Pyrocephalus rubinus the phrase "near water" often appears. 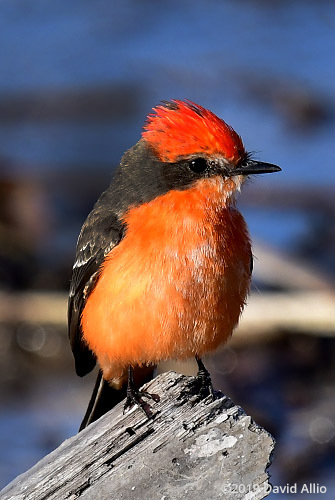 This Vermilion Flycatcher was discovered near the East River Pool of Saint Marks National Wildlife Refuge in Florida. 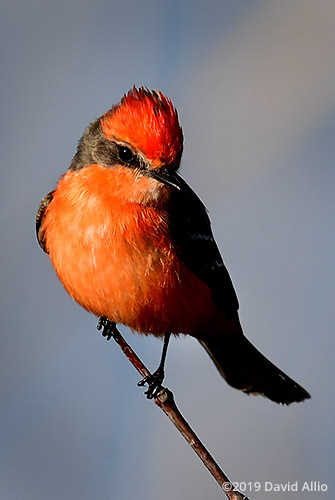 According to the National Audubon Society Guide to North American Birds, a non-breeding male Vermilion Flycatcher Pyrocephalus rubinus "forages by watching for prey from exposed perch, then sallying out to capture flying insects in the air, also by hovering and dropping to the ground for small insects." 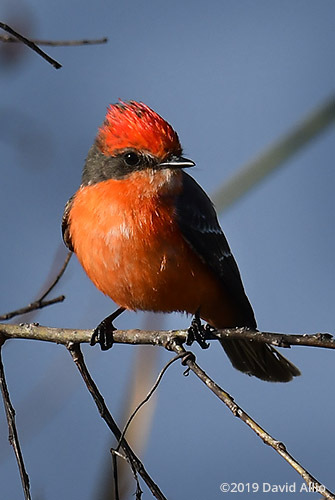 According the the range map provided by Birds of North America, this non-breeding male Vermilion Flycatcher Pyrocephalus rubinus in Saint Marks National Wildlife Refuge on Florida’s Gulf Coast is residing in an area where they are otherwise scarce.